Last edited by littleroundman; 05-14-2016 at 10:44 PM. Want to see how people get caught out ??? But, as so often happens with fraud and fraudsters, Mr Dotson is hiding a dark secret. 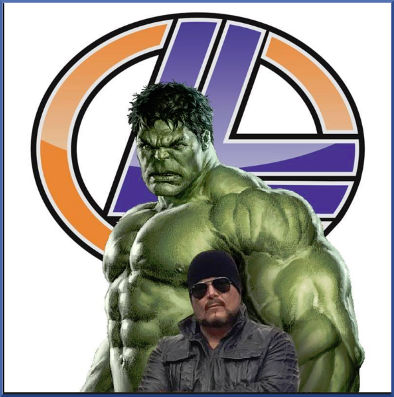 By day Lloyd Dotson may be a mild mannered broker, but, by night he is a serial HYIP ponzi pimp, unashamedly promoting the My Advertising Pays ponzi / pyramid scheme. This time using the alias "I.M. BIGG" Lloyd Dotson is also pimping the soon-to-collapse ponzi / pyramid scheme "Traffic Monsoon"
path2prosperity, okosh, shipdit and 4 others like this. Report a concern about FINRA. 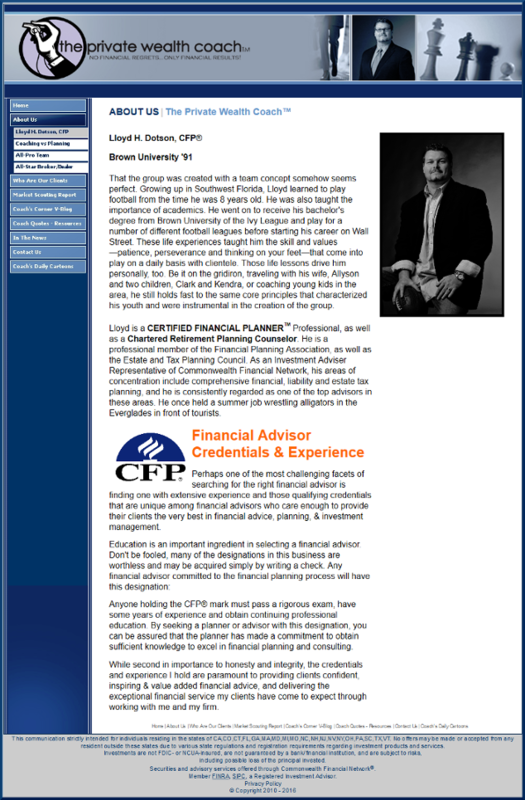 Harvest Wealth Partners New Canaan, CT - Has a ponzi pimp scammer as a financial planner. This is unacceptable. I have reposted the name with city for the benefit of a Google search. Let's get it on page one. don't think he'll be getting fired any time soon. "CFP Board’s rigorous enforcement of its Standards of Professional Conduct — including releasing disciplinary information to the public — distinguishes the CFP® certification from the many other designations in the financial services industry. 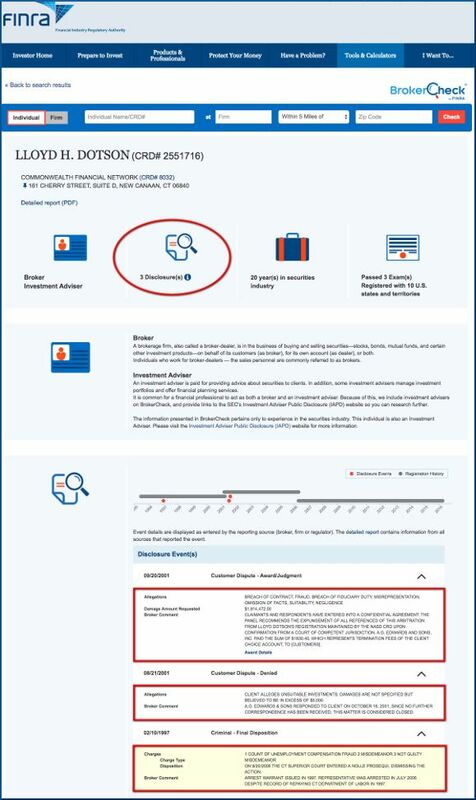 Everyone who seeks CFP® certification is subject to a background check, and those whose past conduct falls short of CFP Board’s ethical and practice standards can be barred from becoming certified. After attaining certification, a CFP® professional who violates CFP Board’s ethical and practice standards becomes subject to disciplinary action up to the permanent revocation of certification. Through diligent enforcement of its ethical and practice standards, CFP Board provides you with the confidence that your CFP® professional is both competent and ethical." Last edited by Char; 05-14-2016 at 11:38 AM. the late 90s looking website listed has no 'winners' of anything. shipdit, Char, ribshaw and 1 others like this. I guess being listed in their "Top Financial Planners Search Engine" is all it takes to count, lol. Individuals who hold the CRPC® designation have completed a course of study encompassing pre-and post-retirement needs, asset management, estate planning and the entire retirement planning process using models and techniques from real client situations. Additionally, individuals must pass an end-of-course examination that tests their ability to synthesize complex concepts and apply theoretical concepts to real-life situations. All designees have agreed to adhere to Standards of Professional Conduct and are subject to a disciplinary process. Designees renew their designation every two-years by completing 16 hours of continuing education, reaffirming adherence to the Standards of Professional Conduct and complying with self-disclosure requirements. Congratulations on unveiling this fraud LRM. 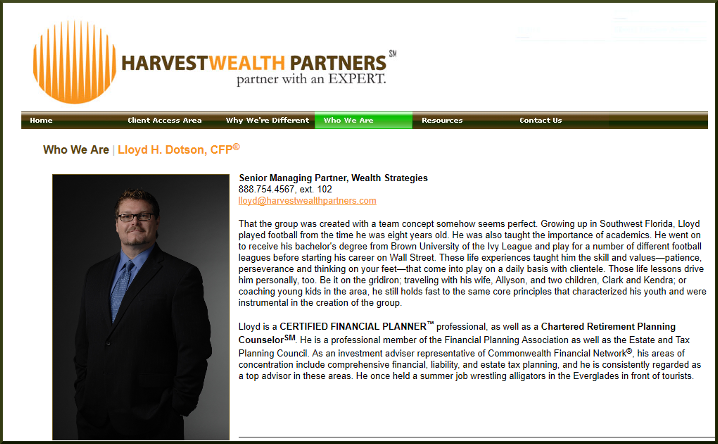 Lloyd Dotson and Harvestwealthpartners do look is if they are respectable business people from the first picture which you showed. It seems inconceivable that this should also be the twerp who expects people to sign up to blatant cons like TM and MAP. Jekyll and Hyde personallity or Bigg Idiot posing as an Ivy League scholar? Soapboxmom, okosh, shipdit and 2 others like this. It's Monday folks. Time to start making some phone calls. 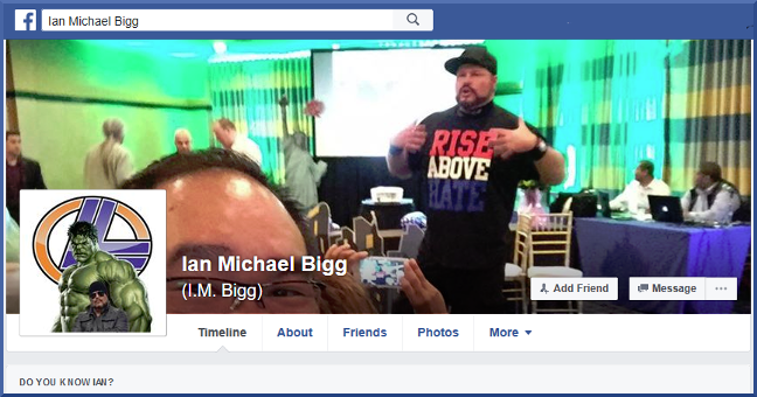 anyone report the big facebook page for not using real name? shipdit, Joe_Shmoe and Bestbud like this. Will do later, but I wouldn't be surprised if Facebook did absolutely nothing about it. I suppose if a few of us report it they might though. they certainly went after my spy account. 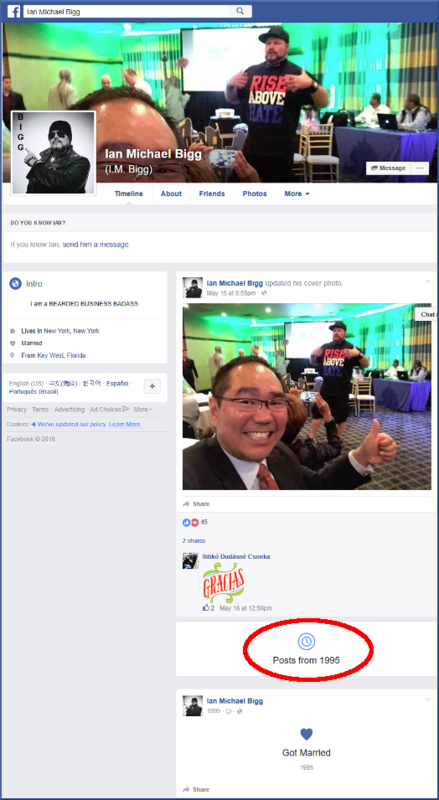 [SIZE=3]Will do later, but I wouldn't be surprised if Facebook did absolutely nothing about it. These people aren't even smart enough to know there's no Facebook Lottery. Figuring Bigg as Dotson and what he's up to, Alzheimer's will be cured sooner. I agree. Problem I have is a spy account isn't doing anything but looking. 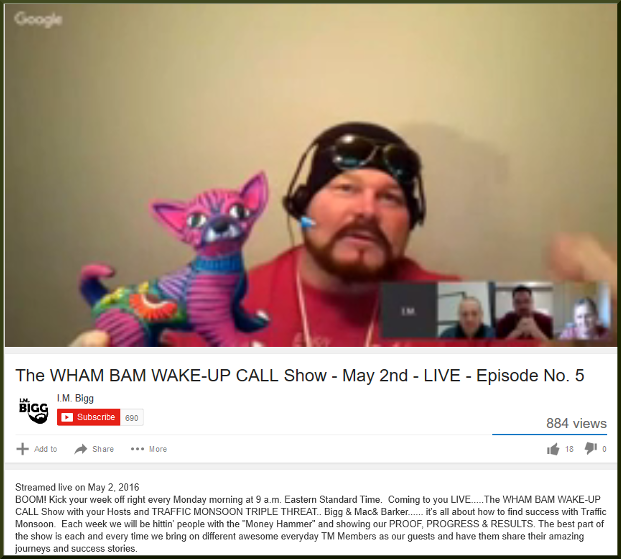 These scumbags are outright stealing from people and we can't get them removed. Would this happen to be the same Lloyd Dotson who is the head of the Western Connecticut Militia? The "Western Connecticut Militia" isn't as bad as it sounds, though. It's a football team, of which a "Lloyd Dotson" is co owner.with a "Carl Oberg"
Who could be bothered "hating" a serial ponzi pimp who acts like a really, really second rate wrestler and uses a fake identity as part of his criminal activities ??? Laugh at, feel sorry for, pity, scorn, poke fun at - maybe.